A finalist in the Best Metal Performance category at next February’s event in Los Angeles, the song goes up against Slipknot’s “Custer”, Lamb Of God’s “512”, “Thank You” by Sevendust, and “Identity” by August Burns Red. The 58th Annual Grammy Awards will take place at the Staples Center in Los Angeles on February 15 and broadcast on CBS starting at 8 p.m. ET. 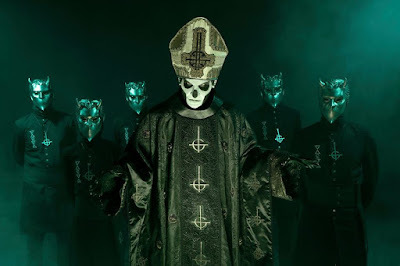 “Meliora” delivered Ghost their first-ever US Top 10 when the album debuted on the Billboard 200 at No. 8 with opening week sales of 29,000 copies. Produced by Klas Åhlund and mixed by Andy Wallace, the project sees the debut of vocalist Papa Emeritus III alongside the Nameless Ghouls. Ghost recently wrapped up the Black To The Future North American tour – which included a US television debut performance on The Late Show With Stephen Colbert – and are now playing dates across Europe to the end of the year.